Helps protect the trainer from liability and makes the client responsible for the trainer's medical payments. A dog trainer's liability for dog bites to another person arises when someone is injured during training, or by a dog that the trainer certified as being safe. During a training session, it is foreseeable that someone other than the trainer could be injured. The possible victims include the dog owner and his guests, other dog owners and their guests, and dogs belonging to other persons. Any injury will be laid at the feet of the trainer because he assumes custody and control of the dog during the session. One of his implied duties is to conduct the session in a manner that ensures adequate safety for other people and their animals. Additionally, training a dog known to be vicious imposes further duties such as the obligation to warn those present and segregate the dog from people and other dogs. Breach of one of these duties would expose the trainer to liability for negligence. There is no statutory limit to the compensation that a victim of dog trainer negligence may be entitled to receive. For that reason, the trainer's legal duties and his clients' remedies for alleged breach of those duties should be circumscribed in a written contract. 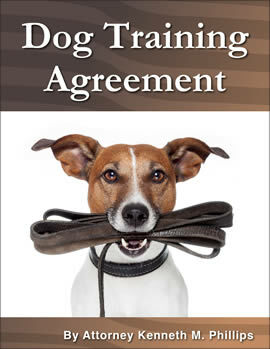 This Dog Training Agreement describes the goals of the training, gives the number and dates of the training sessions, sets forth whether the sessions will be private and where they will take place, establishes the amount of compensation, confirms that the dog owner's representation that it has not bitten anyone or been declared dangerous or vicious by the authorities, and provides that if the dog injures the trainer the client will pay reasonable medical bills and compensation for loss of income.